This index is accessible by subject area, and sorted within subject area by University and year. 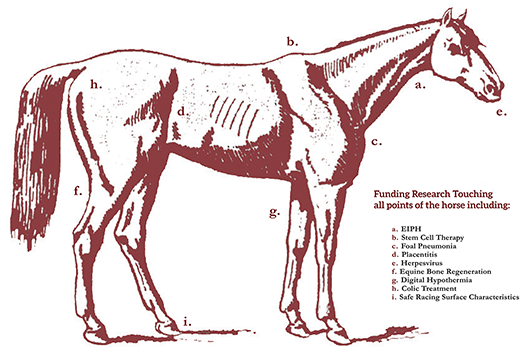 This listing includes projects funded by Grayson-Jockey Club Research Foundation since 1999, including our most recently funded projects. You can use the "Search" or "Find" function of your browser to look for keywords within each subject area. For more information on published papers as a result of these projects, you may contact our office at (859) 224-2850 or contactus@grayson-jockeyclub.org. The Neurologic EHV-1 Marker: Correlation or Causation? Are Mares a Source of Rhodococcus Equi for Their Foals? R. Equi Pneumonia: Does the Magnitude of Airborne Exposure Exposure Predict Disease Development? R. equi Pneumonia: Can a Novel Vaccine Protect Foals? Assessment of a Rhodococcus Equi Vaccine in Foals. Do NSAIDs Affect the Immune Response of Horses to Vaccination? Condylar Fracture in the Thoroughbred Racehorse? Does Cytokine Production Correlate with Reversible Airway Obstruction in COPD and SPAOPD Horses? Is EIPH A Consequence Of High Left Atrial Pressures? With Early Pregnancy Loss in The Mare? Mares With Delayed Uterine Clearance: Is Nitric Acid Involved?